Singapore plans to increase its land supply by nearly 8 per cent to 76,600 hectares (766 Square Kilometers) to accommodate its projected population of 6.9 million by 2030, according to the Land Use Plan report released on 31 Jan 2013. Singapore's total land area now stands at 71,400 hectares. About 60 per cent will be set aside for housing, industry and community facilities -- up from the current 52 per cent. And a large part of the additional land will come from reclamation and freeing up reserve land. 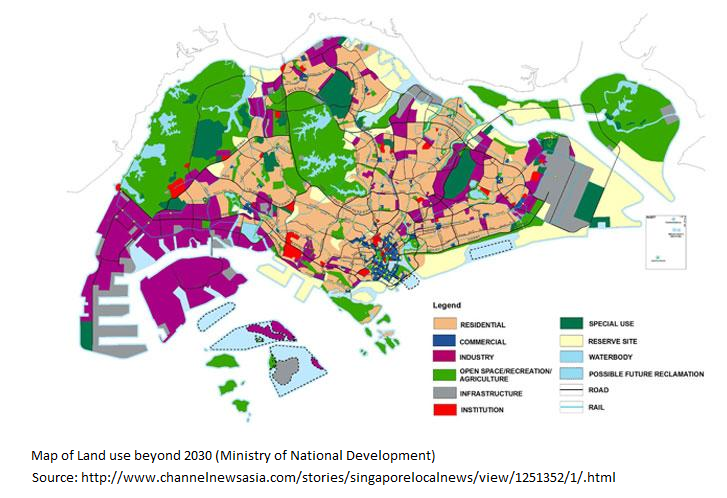 What are the ways in which landuse can be maximised in Singapore? 0 Response to "5,200 hectares more land in Singapore"